Earn $3.65 in Rewards credit (365 points) What's This? The addition of an 11th cog isn't the only highlight of Shimano's newest Ultegra group. The new Front Derailleur takes a cue from Dura-Ace, featuring a totally reworked design for crisp transitions between rings with less lever throw required per shift. Inspired by the smooth performance of their own electronic front derailleurs, Shimano completely revised the FD-6800 cable actuation ratio. This is made possible by an extra long pull arm which increases in power as the derailleur moves toward the outer ring. Combine this updated actuation with Shimano's low friction PTFE coated derailleur cable (included with Ultegra STI levers) and you've got incredibly fluid, precise shifting at the flick of a lever. 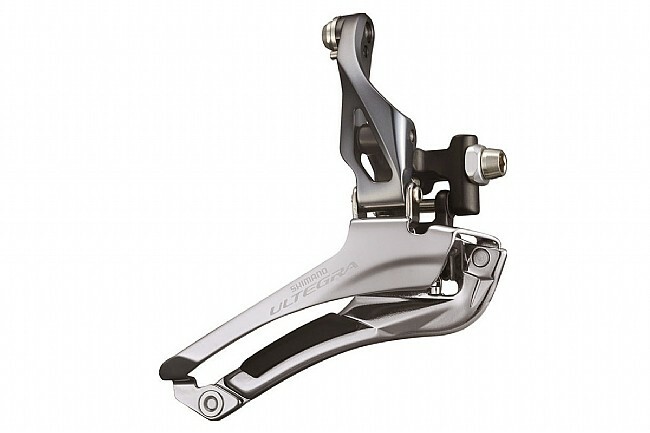 The Ultegra FD-6800 Front Derailleur is available in a braze-on, 31.8mm (with a shim for 26.8mm) clamp, and 34.9mm clamp versions. Recommended for use only with ST-6800 or other Shimano 11-speed levers. Claimed weight: 89g.